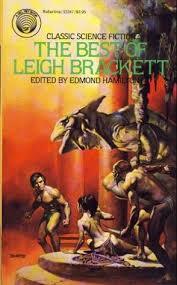 Full of narrative spice, blood and vigour, the Old Solar System of Leigh Brackett has achieved classic status. For a rare sidelight on "moth-men of Phobos" see The Halfling. On the tenth planet: The Jewel of Bas. 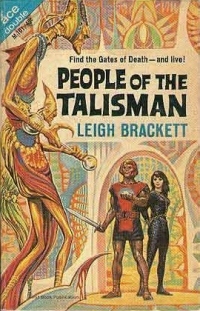 Brackett was one of the greatest sword-and-planet authors. 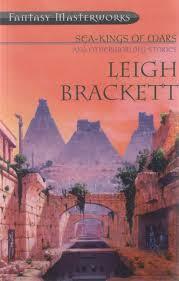 Her work has a flavour all its own, but nevertheless invites comparison with that of Edgar Rice Burroughs. Harlei: Comparison - and contrast. Zendexor: Yes. 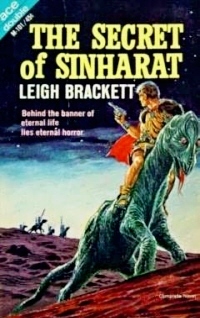 For example, both ERB and LB wrote swashbuckling romantic tales set on Mars, but whereas ERB's Barsoom is an arena for relatively clean conflict and excitement, the Brackett Mars (BrackM for short) is frequently sinister. Whereas on Barsoom the old deserted cities are objects of melancholy beauty, and the more modern cities are fully alive, every single native city on BrackM seems for one reason or another to be crumbling and spooky, or rotten with some secret evil. Only the Earth colony and spaceport, Kahora, has a refurbished and functional feel to it. There were many lights, far below. Tiny pinpricks of flame where torches burned in the streets beside the Low Canal - the thread of black water that was all that remained of a forgotten ocean. Stark had never been here before. Now he looked at the city that sprawled down the slope under the low moons, and shivered, the primitive twitching of the nerves that an animal feels in the presence of death. Poverty, dirt, hardship and a picturesque (and picaresque) scruffiness are rife on BrackM, whereas on Barsoom you seem likely to live well if you can stay alive at all. Harlei: In that connection, I can point out that thievery is unknown on Barsoom (John Carter says so, explicitly) whereas the cities of BrackM include a recognized Thieves' Quarter! Zendexor: Well, there you are. And the environment is a lot less friendly, too. The dead sea-bottoms of BrackM are full of sand and dust, lacking the more pleasant ochre moss cover of Barsoom. As they left the lights of Valkis behind, winding their way over the sand and the ribs of coral, dropping lower with every mile into the vast basin, it was hard to believe that there could be life anywhere on a world that could produce such cosmic desolation. The little moons fled away, trailing their eerie shadows over rock formations tortured into impossible shapes by wind and water, peering into clefts that seemed to have no bottom, turning the sand white as bone. The iron stars blazed, so close that the wind seemed edged with their frosty light. And in all that endless space nothing moved, and the silence was so deep that the coughing howl of a sand-cat far away to the east made Stark jump with its loudness. The crossing of the desert in The Secret of Sinharat is a dire experience for the hero, Eric John Stark, an experience made more frightful because of his increasing suspicion that the woman he's with - the beautiful Berild, Queen of Shun - possesses a mind much older than it has any right to be. On BrackM, threats often lurk covertly like this, compared with the more open challenges you find on Barsoom. Stid: Perhaps it's something to do with the absence of fliers on BrackM. Harlei: How do you work that out? Stid: Less ease of transport, more isolation, and as a consequence of that, more lost cities, lost civilizations and secret festering evils. Zendexor: Don't forget, though, that on Barsoom you have the cities of Manatar and Horz, unknown to the rest... and Jahar hardly known. And the point I'm trying to make from all this is that you can postulate a link between the isolation of cultures and the persistence of evils, and that explains why poor old Stark keeps shivering as he senses hidden horrors. Which in turn makes him moody and discontented, in contrast to the positive-minded protagonists of ERB's Barsoomian tales. Zendexor: I accept what you say. Brackett is into loners in a way that ERB was not. This applies on others of her worlds - for example David Heath's Venusian quest in The Moon that Vanished, and the greed-driven Rand Conway in The Lake of the Gone-Forever. Harlei: I reckon Brackett is closer to Robert E Howard in some ways, than to ERB, though it was ERB's The Gods of Mars that first influenced her and set her on the way to her own Mars stories. In fact, anyone who regrets that Howard wrote no OSS stories (and no planetary adventures at all except Almuric) might (I strongly suggest) take comfort from reading Brackett. Her blood-and-thunder is sometimes as good as his. You'll have to look far before you can find a battle-scene to compare with the attack on Kushat in People of the Talisman. (For more on Kushat and on BrackM cities generally, click here.) ERB does good battles too, in The Gods of Mars and A Fighting Man of Mars especially, but the tone is not the same as Brackett's - ERB's is more hallucinatory, spellbinding like a dream is spellbinding, with the excitement of spilt blood but without its stink. Zendexor: Which reminds me, to consider the morality of the stories. Both ERB and Brackett bathe their writings in a kind of moral-acceptance field, a distorter force-field which slews the values of right and wrong - to the extent necessary for the narrative's particular colour. For example, on Barsoom we have the bloodthirstiness of the main hero, and also his comic vaingloriousness - "You need not feel humiliated at your defeat; far better men than you have gone down before John Carter, Prince of Helium." On BrackM we have what almost amounts to a re-classification of evil itself as a kind of colour on the stories' palette. Women looked at Stark. Women graceful as cats, bare to the waist, their skirts slit at the sides above the thigh, wearing no ornaments but the tiny golden bells that are the particular property of the Low-Canal towns, so that the air is always filled with their delicate, wanton chiming. Valkis had a laughing, wicked soul. Stark had been in many places in his life, but never one before that beat with such a pulse of evil, incredibly ancient, but strong and gay. Jekkara was not sleeping despite the lateness of the hour. The Low Canal towns never sleep, for they lie outside the law and time means nothing to them. In Jekkara and Valkis and Barrakesh night is only a darker day. Carse walked beside the still black waters in their ancient channel, cut in the dead sea-bottom. He watched the dry wind shake the torches that never went out and listened to the broken music of the harps that were never stilled. Lean lithe men and women passed him in the shadowy streets, silent as cats except for the chime and the whisper of the tiny bells the women wear, a sound as delicate as rain, distillate of all the sweet wickedness of the world. They paid no attention to Carse, though despite his Martian dress he was obviously an Earthman and though an Earthman's life is usually less than the light of a snuffed candle along the Low Canals, Carse was one of them. The men of Jekkara and Valkis and Barrakesh are the aristocracy of thieves and they admire skill and respect knowledge and know a gentleman when they meet one. Zendexor: But why don't you care? Answer: because I'm right. The distorter field works. Stid: But - should it? Should we let it? I'm only considering it on your terms, understand. Not minding for myself. Zendexor: It's important that it should work this way. It's right and proper. For since the stories enhance our lives, they needed to be written; and since they had to be written, they had to possess the distorter field - otherwise they would have been bad, for there would have been no translation from one mode to another: we would have had to approve of evil, bloodshed, etc, directly. I used to have a variant of this sort of problem with the Zothique tales of Clark Ashton Smith. They were full of horror and evil, necromancy etc, but also very colourful. In the end I accepted the horror as just a colour, or flavour. And that was that. That's how it works. For a suggestion that Brackett's extrasolar world Skaith could have fitted as a rendition of Titan, see the OSS Diary for 16th July 2016. For the contrast between the Brackett Mars and Barsoom, regarding the location in time of Mars' Golden Age, and including quotation from The Last Days of Shandakor, see the Diary, 3rd November 2016. For Citadel of Lost Ages, about a non-rotating Earth, see the OSS Diary, 4th February 2017. For Brackett's chronology, see the OSS Diary, 15th February 2017. For a suggestion as to Martian history-writing, see the Diary, A Fun Sub-Sub-Genre. 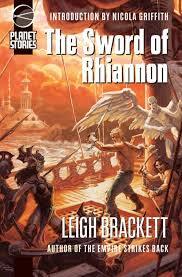 For The Sword of Rhiannon see the Diary for 4th May 2017. For The Halfling see Rich OSS Background for an Earth Tale. For The Lake of the Gone Forever see Chill on beautiful Iskar! and the additional note, How to borrow a fictional asteroid. See also the extract, A snowy but habitable asteroid. For some discussion leading to remarks which exonerate The Secret of Sinharat from a charge of relevantitis, see the Diary for 7th January 2018. For Citadel of Lost Ships see Space Sargassoes, Derelicts and Clumps. 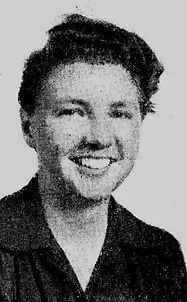 For a literary comparison see Leigh Brackett, Keith Laumer and cosmic tragedy. More extracts: see - Hunted on Mercury - Sighting land on Venus - Sinister encounter on Mars - A murky maze on Ganymede - Trudging through the Martian desert.